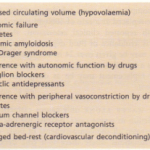 • Left-shifted oxyhaemoglobin dissociation (reduced 2,3- diphosphoglycerate (2,3-DPG)). 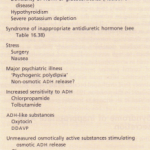 • Confusion, hallucinations and convulsionsMild hypophosphataemia often resolves without specific treatment. However, diaphragmatic weakness may be severe in acute hypophosphataemia, and may impede weaning a patient from a ventilator. Interestingly, chronic hypophosphataemia (in X-linked hypophosphataemia) is associated with normal muscle power. 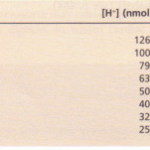 Treatment of acute hypophosphataemia, if warranted, is with intravenous phosphate at a maximum rate of 9 mmol every 12 hours, with repeated measurements of calcium and phosphate, as over-rapid administration of phosphate may lead to severe hypocalcaemia, particularly in the presence of alkalosis. Chronic hypophosphataemia can be corrected, if warranted, with oral effervescent sodium phosphate. 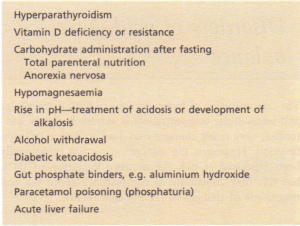 Hyperphosphataemia is common in patients with chronic renal failure. 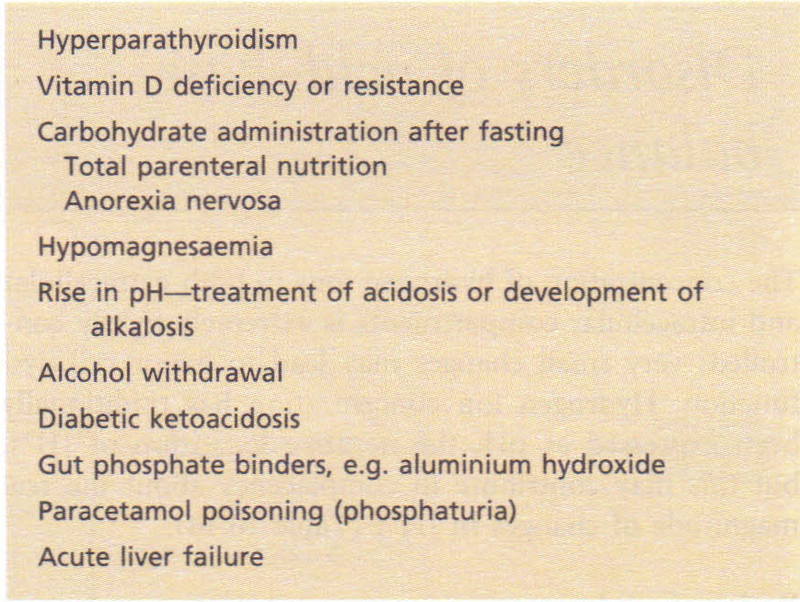 Hyperphosphataemia is usually asymptomatic but may result in precipitation of calcium phosphate, particularly in the presence of a normal or raised calcium or of alkalosis. Uraemic itching may be caused by a raised calcium x phosphate product. Prolonged hyperphosphataemia causes hyperparathyroidism, and periarticular and vascular calcification. 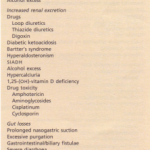 No treatment is usually required for acute hyperphosphataemia, as the causes are self-limiting. 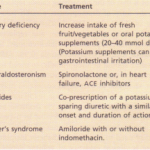 Treatment of chronic hyperphosphataemia is with gut phosphate binders and dialysis.